This text provides a clear and systematic introduction to the development of social and political theory in modern Italy. It gives particular attention to relating the main traditions of Italian thought to the history of the country since unification. The work concentrates on six major thinkers, examining how their theoretical ideas influenced their analysis of political behaviour. The thinkers concerned are Pareto, Mosca, Labriola, Croce, Gentile and Gramsci. In discussing the respective theories of each author, the book situates them within the intellectual and social contexts to which they were addressed. The concluding chapter focuses on the recent debates between Bobbio, della Volpe and others about the validity of the Italian road to socialism and its compatibility with the liberal values and institutions of Western democracies. 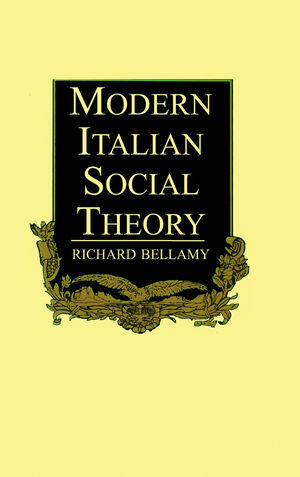 Richard Bellamy is the author of Modern Italian Social Theory: Ideology and Politics from Pareto to the Present, published by Wiley.